That’s the motto of current government and the administration working under it. You are a nationalist, a patriot, son/daughter of the soil only if you believe in the ideology of RSS (Rashtriya Swamsewak Sangh) which says that Bharth Rashtra belongs only to the Hindus. All the other religions namely Islam and Christianity came from outside and hence their followers doesn’t belong here. Interestingly their Bharat Rashtra constitute today's India+Pakistan+Afghanistan+Bhutan+Bangladesh+Nepal+Sri Lanka+Myanmar and they claim all of them. The Hindu Dharm for them is of the upper caste Hindus where Shudras or lower castes are at the bottom of strata. This ideology in the recent past say after coming up of Modi government has hold strong ground and targeting religion of others, others Hindus (Dalits and lower castes) and anyone who differs from their ideology like left ideology and secular ideology. All RSS affiliated organizations are working hard for a Hindu Rashtra which is totally different from one imagined in our constitution. ABVP(Akhil Bhartiya Vidhyarthi Parishad) which is the students’ wing of the BJP is also one of them. They engaged in duels, violent protests against left student wings which is creating tensions in many universities of India. Jawahar Lal Nehru University (JNU) which is a stronghold of Left parties is their main target. 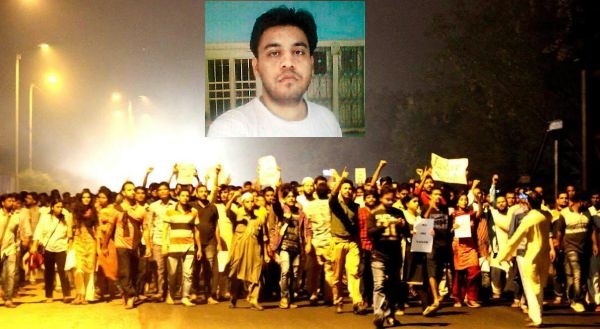 They threw all their energy in declaring it anti-national during arrest of JNU Student Union president Kanhaiya Kumar and other left wing students after a protest in the university campus on Afzal Guru hanging. When this campaign failed after their release from the court ABVP students remain engaged in tussle with them. In the recent incident ABVP affiliated students assaulted Najeeb Ahmad a first year MSc student of biotechnology inside the university campus on 14 October 2016. Since that night Najeeb Ahmad is missing. Delhi Police which works under Home Ministry is failed in tracing him even after 21 days. Mainstream media is still busy in creating Indo-Pak war situation in their studios neglecting the news of missing student. Her mother along with s ome JNU students is continuously demanding quick action not only from Police but also from the Delhi CM, Lieutenant Governor and from the Home Ministry. Police delayed the search operation at every stage. They didn’t search the campus initially and haven’t arrested the ABVP students who assaulted him. I fear for his life because even if he was kidnapped his kidnappers would have killed him in fear of revealing their identity. There is a possibility that he is hiding for some threats thus finding him becomes more important for police. People elected Modi government for development, for the good days he promised and because he believes in welfare of all but the incidents happening last two and a half years proving different intentions of the government. These things not only affected the work done by the government but also malign the image of country in the world. I am ending this post with the hope that police find Najeeb Ahmad soon and things transform for the better of India. God Bless India.